Construction Lines: Journeys Beyond the Canvas is an exhibition of new work by Francisca Prieto that challenges the definition of painting – opening up new landscapes, feelings and encounters. Francisca Prieto’s work is a beguiling mix of precision and fluidity. 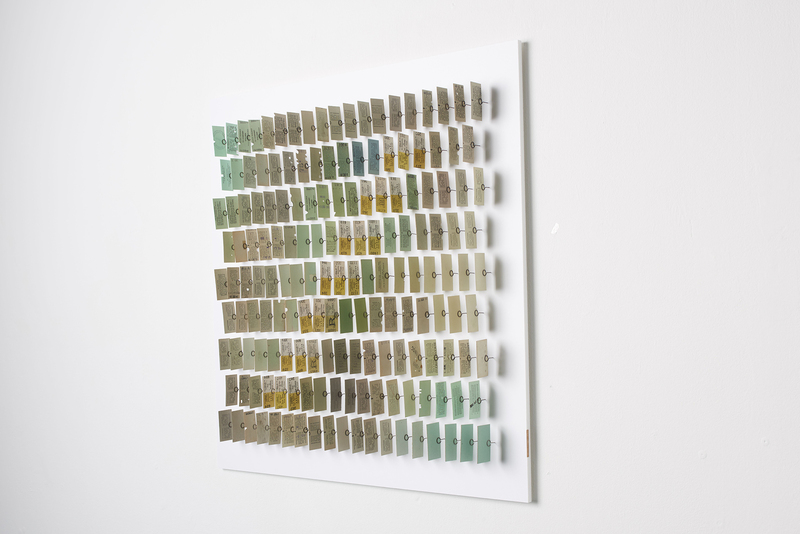 She transforms collected fragments of the past — such as antique papers, periodicals and books — into dynamic, modular sculptures. 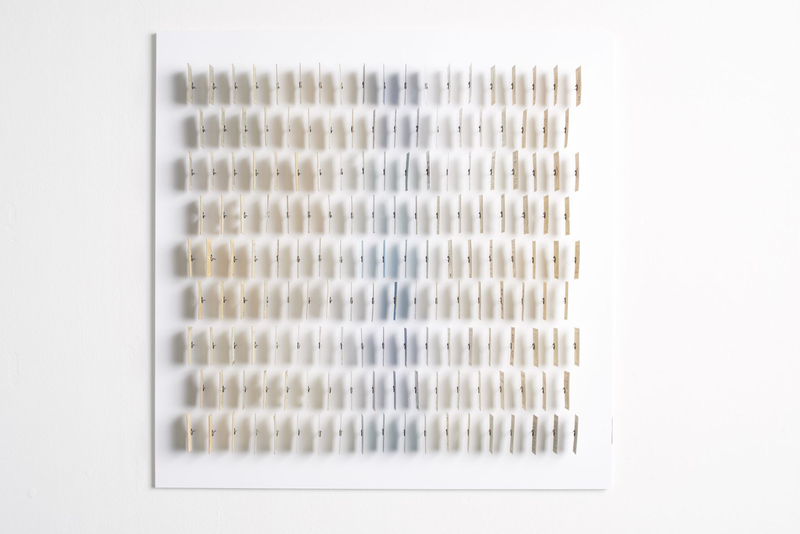 The spatial quality of her work reads both up close and also from afar, creating a powerful discourse between the individuality of the parts and the whole. This show explores the possibilities of painting. 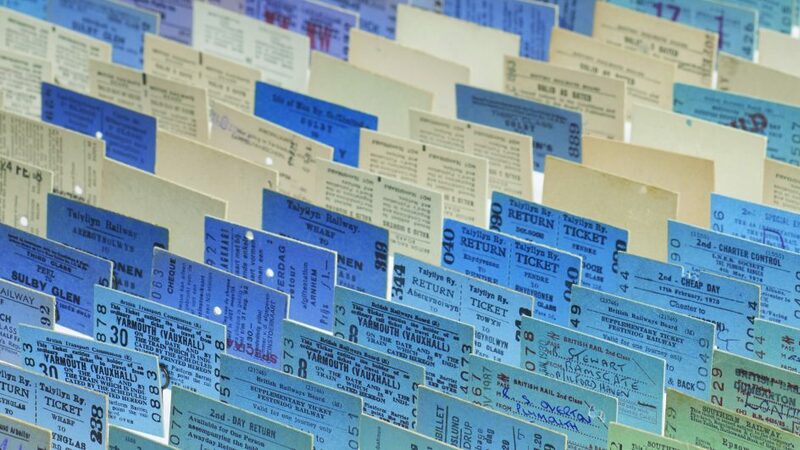 Constructed from the artist’s extensive collection, vintage card railway tickets are held, suspended in space, to create chromatic waves that shift and change depending on the viewpoint. The tickets are ordered as paint would be applied, to suggest abstract forms and visual texture, and to evoke the imagination. Each ticket holds the memory of a private journey in its patina of marks and wear. When placed in formation, ordered by colour and design, they construct a new topography peopled with wonderful, impossible encounters. The series draws on the ideas of Alexander Rodchenko, expressed in his seminal essay The Line (1921), where ‘the notion of the picture as the product of painting’ is liberated from representation and replaced ‘by the experience of spatial construction’. These compositions use the uniform format of the ticket to materialise a line in space — becoming, in effect, a new journey. Francisca Prieto was born in Chile, where she trained and worked as a graphic designer. In 2001 she moved to London to study for an MA at Central Saint Martins, where she still lives. Her work features in public collections including the National Art Library at the Victoria & Albert Museum, the Tate Gallery and the British Library.